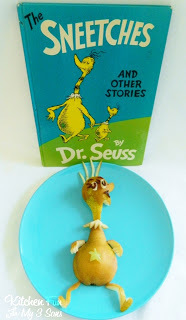 There is a birthday coming up for Dr. Seuss and we love making Dr. Seuss fun food! We wanted to make a healthy Dr. Seuss snack so we came up with this Sneetch Pear Snack! 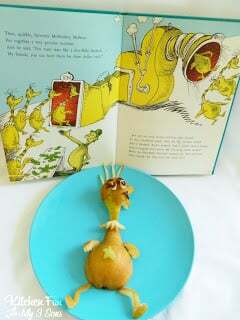 The Sneetches is one of my boys favorite Dr. Seuss books! This was so fun to make and my boys really loved this! You start out by cutting the pear in half. 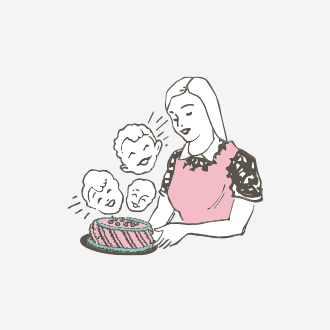 Place the one half on a plate for the body. Cut around the other half in the shape of the Sneetch’s head & beak. 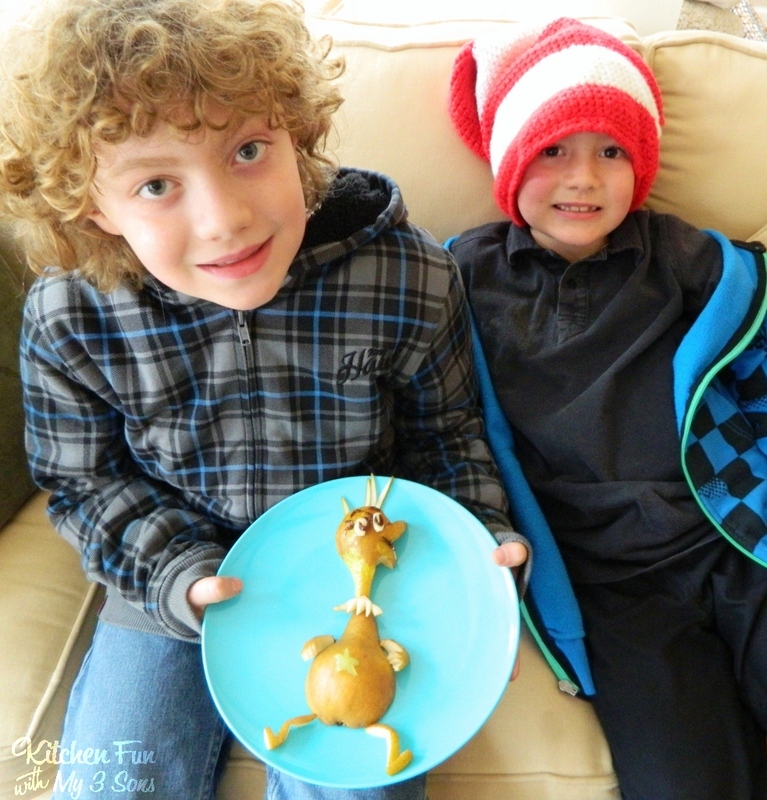 We cut the arms, legs, eyes, & hair using the scraps that we cut off from the head. We cut up a few raisins t make the pupils, eye brows, and mouth. We cut a green grape in half and then cut the half into a star for the belly. 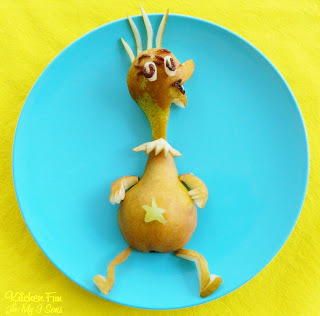 These Sneetches are perfect! I love how you created the legs, arms, and furry collar out of pear. So clever. Thanks Beth! Such a cute book! Another creative idea! Love it! This is so funny and cute! 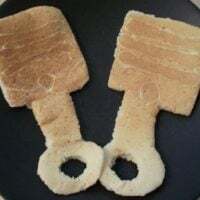 Love it 🙂 At least that's one way to get kids to eat and have fun at the same time! Awesome idea! 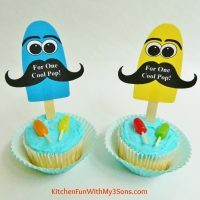 I am having my second son's 1st birthday party this weekend and I am doing a Dr. Seuss theme. 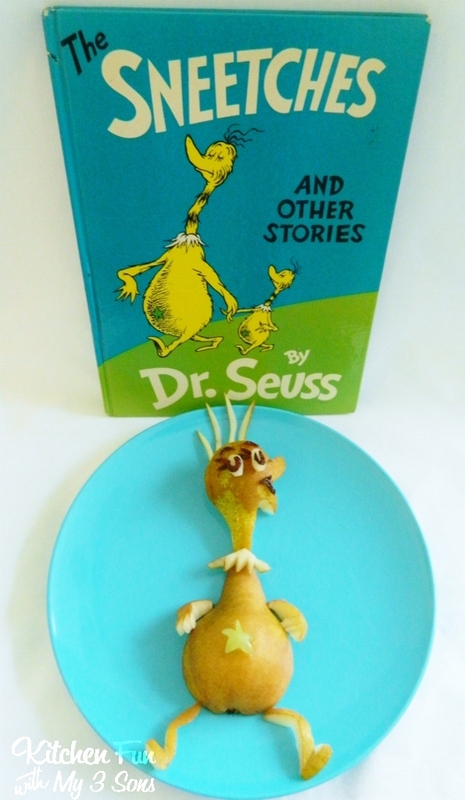 (sadly I was idiotic enough to not realize it coincided with Dr. Seuss' Birthday :)). I need to try to recreate a few sneetches for the buffet table.